The GoPro waterproof case is extremely durable and water resistant to 45 meters. Ideal for diving, snorkeling and other underwater activities. The silicone protective housing cover fits around camera securely in order to protect the camera from bumps and knocks. Give your action-cam set the home that it deserves, with this case. Keeps your camera safe and sound from scratching, shock and dust. Red filter is professional color correction for blue and tropical water. Anti-fog insert prevents lens fog in cold and humid environment. 【Perfect Design】The accessories kit is specially designed for GoPro Hero (2018) Hero 6 Hero 5 Black action camera. Ideal for travelling and home storage. 【Waterproof Housing Case】The waterproof housing case for Go Pro HERO (2018) Hero6 Hero5 is made of high quality PMMA material, extremely durable and water resistant to 45 meters. Ideal for diving, snorkeling and other underwater activities. Convenient to link camera with other accessories mount through this case. 【Small Travel Case】Made of excellent EVA material with 6.2 x 4.3 x 2.5 inch dimension. 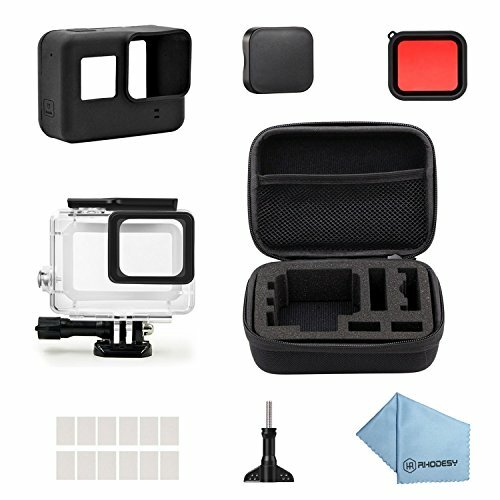 Keeps your GoPro and accessories safe, protected, and organized. 【Silicone Protective Case】The silicone case fits around camera securely in order to protect the camera from bumps and knocks. Silicon traps heat in, improving the GoPro' s battery life in cold conditions. 【Red Filter & Anti-fog Insert】Red filter is professional color correction for blue and tropical water. Anti-fog insert prevents lens fog in cold and humid environment. Compatible with all GoPro cameras and other cameras and housing systems.